Two von Stiehl favorites were crowned as award winning wines with gold medals from the Tasters Guild International Wine Competition: Crimson Royale and Oktoberfest. What’s more exciting is the double gold medal awarded to von Stiehl’s 2014 Sierra Foothills Montepulciano! It’s nothing new for Wisconsin’s oldest licensed winery to be recognized for its award winning wines. However, receiving double golds on dry red releases is a feather in the cap for von Stiehl Head Winemaker, Aric Schmiling, and his team. Montepulciano is a delicate red that required a lot of attention. We had to be exact with fermentation, pump-overs and pressing. If anything would have been hurried, we would have lost the finer berry notes. Careful aging in French-hybrid oak developed a satisfying mouthfeel highlighting the barrel spice. The development of von Stiehl red wines has taken us to Italy! Montepulciano is a medieval and Renaissance hill town and commune in the Italian province of Siena in southern Tuscany. With so many common varietals on the shelf, we seek to experiment with and provide wines not common among Wisconsin wineries. Crimson Royale is more than an award winning wine which received a gold, it’s also the largest selling von Stiehl wine on the shelf! Concord grapes are picked and pressed. Juice is then cool-fermented in stainless steel. It pairs well with creamy cheddar or havarti. It’s a great everyday wine for foods like macaroni and cheese and roasted turkey breast. Oktoberfest is a semi-sweet blend of Riesling, Gewurztraminer, and Vignoles. This gold medal-winning wine has grown a following that makes it the winery’s best selling white wine. It was originally developed for the Wet Whistle Wine Fest in 2002. BrewVino Steer Roast Saturday June 10, 2017 at the Von Stiehl Winery in Algoma, Wisconsin. Photo by Len Villano. Man Fire Food is a favorite Food Network show of our head winemaker. So, Aric reached out to Man Fire Food producers with photos of what was happening every June at von Stiehl Winery. They loved the idea and quickly scheduled BrewVino Roast for the sixth season of Man Fire Food. The episode featuring Algoma titled “Heavy Metal Meat,” debuted on August 8, 2017. Not only did this episode run on the Food Network, but the BrewVino Roast was added to a second episode featuring “Fire Festivals”. We’ll be sure to share the links once they become available. •A Steer is raised on Ahnapee Brewery spent grains at the Bryersquart Family Farm in Door County, Wisconsin. •The steer is butchered by Otto’s meats and allowed to age for 21 days in their facility. •Two days before the event, the steer is bathed in a von Stiehl Winery cherry wine marinade. See the recipe. •The steer is taken out and injected with more marinade! It stays in the cooler for the remaining 12 hours before roasting. •Roasting pit is prepped and the fire is started around 2 am. Pit heats up until the steer is placed by forklift at 5 am. •Steer cooks for 7 hours (or so). •Forklift removes and places the animal in the butchering area, where four qualified butchers spend up to two hours slicing and chopping. •Lunch is served! Profits from the steer plates are donated to the Ribbon of Hope Foundation, where 97¢ of every $1 received goes to grant recipients. What started as a simple way to use up spent grains, turned into a feat of funding breast cancer survivors. What would a feeding at a winery be without a few other activities? 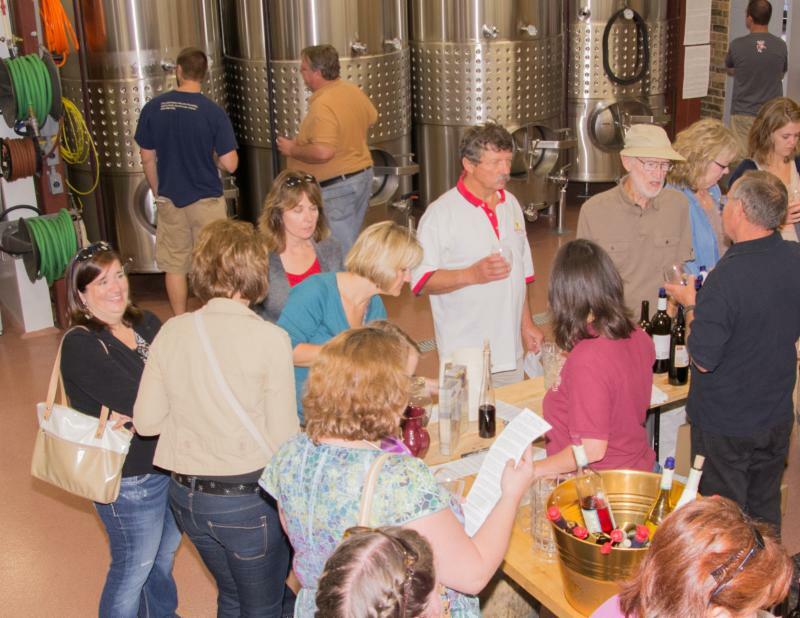 Join the fun and taste von Stiehl Winery wines and Ahnapee Brewery beers. A special wine and beer is created for the day, and extra tastings are offered inside of the winery cellars. Music by MockingBird keeps us going in the morning, and Donny Pick and the Road Band will light things up in the afternoon with the blues. Get the whole scoop and purchase tickets on the event page before they sell out. Montepulciano – An Italian Grape Makes it to Wisconsin! Let’s talk about something that isn’t easy to say. Everyone seems to have finally nailed down the pronunciation of Merlot, Chardonnay, and Cabernet Sauvignon. Now, if you’ve also finally mastered Gewürztraminer it may be time for a new challenge: Montepulciano! Montepulciano is a second-nature wine expression in Italy. It is rarely found in northern Italy because the grape has the tendency to ripen late. You’ll find it mainly in the central and southern part of the country. It follows Sangiovese as Italy’s second most widely dispersed indigenous grape variety. The grapes are plump with a low skin-to-juice ratio. Traditional characteristics are deep ruby color, low acid, and mild tannins. Since Italy is too far away to ship us grapes, we found a supplier in the Sierra Foothills of California in 2014. After harvest, our small lot of nine barrels spent 14 months in French-hybrid oak before another five months of bottle aging. Our Montepulciano is rich in color with moderate acidity. Blackberry fruit flavors and barrel spice lead the characteristics of the smooth, mellow red. It’s easy to drink, and will enhance any red sauce pasta dish. Keep a bottle around for pizza night too! Montepulciano will debut in our tasting room right around the weekend of November 12. Being the astute reader that you are, you’re thinking that you’ll try this new red along with Mourvèdre during your November visit. (We announced the release of Mourvèdre in our November case club newsletter.) After that announcement, we tasted the wine. We know – a little backward. It is wonderful but is still grappling with bottle shock. So the Mourvèdre will stay on its wine stack for another six months. Pull out those red pasta recipes. Then visit us to sample Montepulciano (not Mourvèdre) in the tasting room this November! Posted in von Stiehl Winery | Comments Off on Montepulciano – An Italian Grape Makes it to Wisconsin! We women like options when it comes to accessorizing! It’s not that my lime green purse is old or worn, it still looks great! It’s just that I’m tired of it. I have this funky set of earrings that are just too nice to sell to a second hand store, but now that my hair is short with red highlights, they just don’t work. I have this beautiful scarf that went great with that sweater before it got a big red wine stain. My husband recycled the sweater by putting it on the scarecrow in the vineyard, but I wouldn’t let him have the scarf to complete the outfit. What’s a girl to do with all of these fashionable items? I can’t just give them away. I think I’ll take them to the von Stiehl Swap Meet! Shop without money while you enjoy wine and light appetizers. Here’s how it works: You get a ticket for every item that you bring, then you use those tickets to purchase something new (to you) and different. Not paying a thing for all of those new things is only part of the win. In addition you can take 25% off of wine purchases (6 or more bottles), and enjoy a glass of wine with your $10 admission to the event. Call 800-955-5208 to reserve your spot in the swap meet, then use your new found excitement to start cleaning out the closet! Disclaimer: This was written by a man. I apologize for the imperfections in thought patterns while writing to promote this event. Be first in line at this red wine tasting and sample the newest and oldest vintages currently in barrels. Barrel-fermented Riesling, Brunello, Mourvèdre, Montepulciano, Tempranillo, and Marquette are some that are waiting for you. Aric, Dave, and Chad will be on hand to pull samples from the barrels in our cellars for you to taste, forecast, and purchase at a discounted price. Your session will include appetizers, five unique barrel tastings, and past vintage reserve tastings. Cost is $20/person and space is limited, so please call soon to reserve your spot. 800-955-5208. Live Music is like heat in Wisconsin. It isn’t around for long, but when it’s here there’s no missing it – and the Summer Cuisine Concerts are hot. Finding live entertainment in the Door County area is easy on any given day in summer. So you hear “live music” and think “big whoop, everybody’s got that.” You’re right, and we agree that it takes more than string pluckers and cover singers to make a summer day special. So we start with talented musicians and add wine. If you like von Stiehl, then that’s the start of something good. More of a beer drinker? Got you covered with small batch craft brews from our tap room two doors down. Music, wine, and beer all need food. Good food? No, great food! Hence the Summer Cuisine Concerts name. Who serves the best Door County cuisine? Many would say Skaliwags. The Skaliwagon will be serving fantastic gourmet outdoor faire at all of the concerts. More on them in the next article. What’s the last thing we all would like to make things perfect? The weather. Typically, the coolest summer breeze is found on the shore of Lake Michigan in Algoma. While the rest of the state is soaking in sticky 80-90 degree temps, we’re enjoying soothing 75 degree air wafting in from the lake. The same lake that you will enjoy viewing while partaking in all that other stuff that goes along with string pluckers and cover singers at von Stiehl this summer. The second annual Gala Wine and Beer Tasting Trolley Tour on behalf of Money Manager Counselors is scheduled for 5:30-9:30 p.m. May 14. The budget, credit and financial planning counseling agency is formally known as Money Manager Counselors powered by FISC/CCCS, incorporating the former names of the nonprofit that has been helping Door County families for decades. Participants in the trolley tour will meet a Door County Trolley atop the Second Avenue parking ramp between Kentucky and Louisiana streets between 5:15 and 5:30 p.m. May 14, then depart for Von Stiehl Winery and Brewery in Algoma. After about an hour at Von Stiehl, the group will board the trolley for a trip to Red Oak Winery in Sturgeon Bay. There, the group will partake of more wine tasting with heavy hors d’oeuvres, a silent auction and cash bar until about 9:15 p.m.
Tickets are $50 per person, and space is limited. Reservations for the fundraising event can be made by calling (920) 743-1862. Doesn’t a little weekend getaway sound appealing right now? A Caribbean cruise is probably not in the cards for most of us, but the idea of an all-inclusive, fun-filled weekend really hits the spot. Here’s an idea: come to Algoma! Take a look at this invitation from our friends at the Hotel Stebbins and come on up! We’ll have your Wine and Chocolate Pairing ready for you. Booking Info: (920) 487-5521 or see package here. Posted in von Stiehl Winery | Comments Off on All-inclusive, fun-filled weekend!